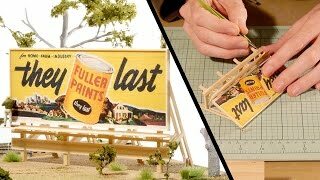 In this build guide I’ll show you a unique design you can use to build a large billboard for your layout. The most important step is…… don’t forget to model the back of the sign. A sign that has been modeled both front and rear will look fantastic compared to one that is only the main billboard. This will look great when your model trains run past this on your model railroad layout or if you model war gaming terrain then this can also compliment any scene you wish to place it in.